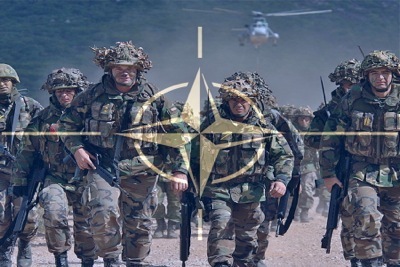 Washington and NATO control the narrative. Here, Lt. Gen. Hodges meets with “defense writers”, and tells them the spin. Was he able to talk about diplomacy with a straight face? …Hodges told reporters to think of Atlantic Resolve as a continuous series of exercises, with American troops operating with troops in Estonia, Latvia, Lithuania and Poland, demonstrating America’s commitment to the defense of these NATO allies. Later this month, Atlantic Resolve exercises will expand to include Bulgaria and, later in the year, Romania, he said. An airborne battalion from Vicenza, Italy, will jump into Romania and link up with a Stryker squadron coming by rail from Vilseck, Germany, Hodges said. “That will begin the introduction of [Operation Atlantic Resolve] into the south,” he added. 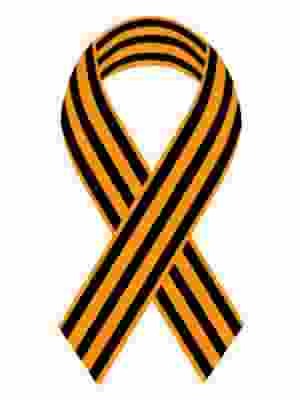 U.S. Army Europe also is working with countries in NATO’s Partnership for Peace program, including Georgia and Ukraine. Beginning next month, troopers from the 173rd Airborne Brigade will train Ukrainian Interior Ministry troops, and in May, U.S. paratroopers and tankers will exercise in Georgia, Hodges said. Reporters pressed Hodges on whether the United States should provide weapons to Ukraine. He said he can see both sides of the argument, but that the focus should not be on the weapons decision. “The focus should be on what is the desired end state, and can we get there using diplomatic and economic pressures and support,” he said. 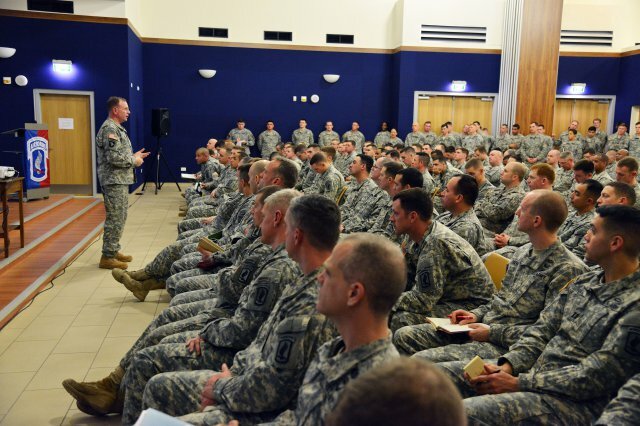 VICENZA, Italy: “I want to talk you today about Strong Europe,” said Lt. Gen. Ben Hodges, commander of U.S. Army Europe, speaking to paratroopers assigned to the 173rd Airborne Brigade here on Feb. 24, 2015, about their role in Europe and what they represent. During his visit, Hodges observed the brigade’s preparation for its scheduled training mission in western Ukraine, providing feedback for paratroopers who will train the newly-formed Ukrainian National Guard. Hodges emphasized the important role the 173rd Airborne plays in enabling the NATO Alliance through multinational exercises. Strong Europe represents the strategic framework that Hodges introduced since taking command last year of the approximately 30,000 Soldiers forward stationed in Europe. Training allows paratroopers from the 173rd to exercise their own quick-response procedures. As the Army’s Contingency Response Force in Europe, the brigade maintains the ability to deploy on short notice to conduct the full spectrum of operations across the U.S. European, Africa and Central Command areas of responsibility.